Malaria is a disease caused by a parasite called plasmodium. It’s carried exclusively by female mosquitoes and transmitted as the infected mosquito bites different people. Male mosquitoes don’t feed off blood like females do, so it’s impossible for male mosquitoes to carry the disease. In 2015, there were around 212 million malaria cases and an estimated 429 000 malaria deaths, according to the latest World Health Organization (WHO) statistics. Although malaria incidents have been drastically reduced in recent years, a staggering 3.2 billion people remain at risk of the disease. That’s almost half of the world’s population of an estimated 7 billion. Unfortunately, the majority of deaths are children, and pregnant women are “particularly vulnerable” to the disease. This means that if you’re pregnant or travelling with little ones, you’ll need to be extra vigilant in high-risk areas or stay away from them altogether. Where is it most prevalent? There are low, intermediate and high risk areas. Reports published by the Against Malaria Foundation say 90% of malaria cases occur in sub-Saharan Africa, specifically in subtropical Mozambique and Swaziland. Other high risk areas include the Kruger National Park, Malawi, Botswana, Zimbabwe and Zambia, the Lowveld of Mpumalanga, and Limpopo. If you’re planning on travelling to any of these areas with your children, it’s best to speak to your healthcare provider (for the latest prevention advice) before you go, as well as take steps to avoid contracting the disease while you’re there. The good news is that malaria doesn’t have to be fatal. It’s a preventable and treatable disease. The first thing you need to do is check if where you’re going to is a malaria area. If it is, then you and your family should take preventative measures. 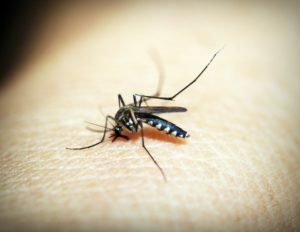 Mosquitoes most often bite between dusk and dawn, so it’s best to stay indoors during this period, or cover exposed skin with light clothing or insect repellent. Make sure to fit a mosquito net around your little one’s cot or bed. Good products that are safe for babies and young children are the Pure Beginnings Insect Repellent Spray (R58) and Insect Repellent Stick (R48). They’re made with citronella, lemon eucalyptus, neem and lemon bush. Remember to spray ankles with repellent, as mosquitoes tend to prefer biting this area. Burn anti-mosquito coils, and keep netted screens closed to significantly reduce the risk of bites. Keep a fan on in the room during the night – the air circulation seems to keep mosquitoes at bay. Anti-malaria medicines can be taken before you leave for your trip, which can help to decrease the chances of contracting the disease. It’s important to speak to your doctor about safe medicines for babies and toddlers, as they are associated with side effects. There are three types of malaria medications available for the strains of malaria occurring in South Africa, namely Doxycycline, Atovaquone/Proguanil and Mefloquine. To diagnose malaria, your doctor needs to do a blood test and you may be hospitalised for observation, according to Fedhealth. Malaria can be cured with prescription drugs, but the type of drugs and length of treatment depends on the strain of malaria, the area where it was contracted, as well as age, and how severely ill you or your family are. The WHO also recommends adjusting malaria medication doses for children under 25kg. Hluhluwe is regarded as a low risk area for malaria. Only in the summer months between November to end of March one should take extra precautions against malaria. Our suggestion is that you consult with your general practitioner to prescribe the necessary prophylactics. Rooms are air-conditioned with ceiling fans to ensure your comfort. Remember to bring anti-mosquito spray or lotion, especially in the evenings when most mosquito activity occurs.